Magnitude Matters: The first of Which Will Come First? The first of Which Will Come First? I am introducing a new theme on the blog: Which Will Come First (WWCF)? This could alternatively be called "Can you believe people used to? . . .", but I wanted to make it more predictive with a comparison. Here is the first in the series. The first negates the need to haul a sufficient portion of one's wardrobe around when travelling. The second is NetJets for the hoi polloi, a democratization of high-end air travel, which potentially ends most of the hassle costs of flying commercially. Thinking back to Mark Perry's post, which was the inspiration for this post of mine, we see that the real cost of air travel per passenger mile has fallen from about $.31 in 1980 to about $.14 today. 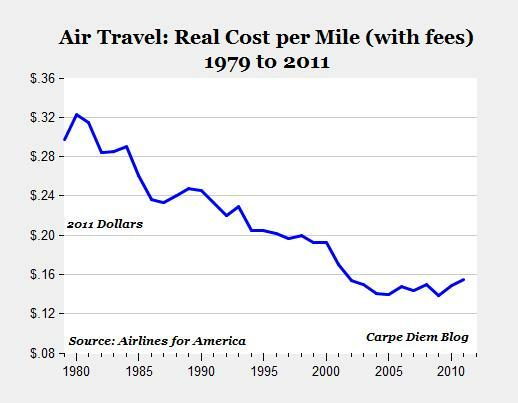 The cost of a G5 per passenger mile is about $1.67. Using the decline rate in the curve above (about a 2.5% reduction in cost per year), we would very simply extrapolate that I'll be in a G5 in about 90 years--when the $1.67 cost has decline in real terms to $.14. But that is probably a big oversimplification that understates the realistic decline expectations. It is leaving out income growth (not me personally, but for the middle class) and increasing returns to scale as we get closer and closer to the destination. Let's assume real disposable income growth is below the historic trend and is 2.5% per year. Now Malcolm in the Middle is circling Fantasy Island in less than 50 years. And we have still not considered how as a new innovation becomes closer to reality the cost curve spirals downward spurred by a virtuous cycle of investment and breakthroughs. Just think about the Walkman for 20 years followed by the iPod for 10. Unfortunately, I don't have anything substantive on high-tech clothes. I'll add it here and in a follow-up post when I stumble upon it. My guess is that the clothing will be widely used about a decade before fractional-jet-ownership will commonly used by the middle class.